The page on William Gardner (see below) was deleted on 02/06/2013. 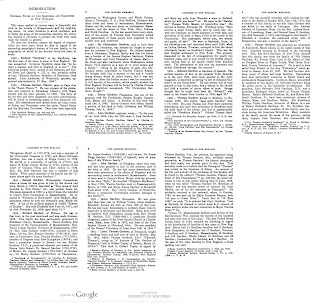 See Remarks (02/06/2013 and 06/15/2013) for related discussion. A future post will take a brief look at origins (with a reference to this material). The end of the middle ages can be linked with the War of the Roses. 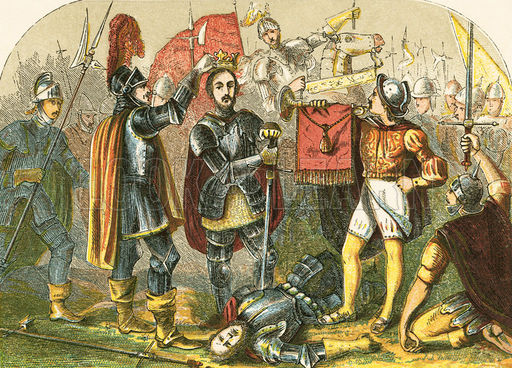 A key event was the Battle of Bosworth. Richard III of the House of York was killed at Bosworth Field; he was the last of the Plantagenet kings. Some say that William Gardner was one of the slayers of King Richard and that William later married Helen Tudor who was the granddaughter of Owen Tudor. There are several questions to ask about William and Helen. Who were their children? What do we know of succeeding generations? It turns out that there are several viewpoints. Let's look at a couple of these. In the Who's Who of Tudor Women by Kathy Lynn Emerson, we find this about William and Helen (c. 1459-1488). They were married before the Battle of Bosworth. Their only confirmed child was Thomas (c. 1479-1506) who was a Pryor at Tynemouth. Emerson also says that they were not parents of Stephen (d. 1555), Richard (1486-1546), William (1488-1549), or Alice (d. 1588) Gardner. On the other hand, the Wikipedia article on Stephen Gardiner says that William was his father. Stephen was twice the Bishop of Winchester. Too, he managed to survive the turmoil of the times. Also, Richard and William (mentioned above) were brothers of Stephen. I thought that it might be interesting to look at the results of the research of several families. There seems to be a common theme. As before, I have provided links to databases at rootsweb. Knowlton tree, descendants of Stephen Gardiner suggests siblings for Thomas of Salem and ties in the Lionel line. The tree quotes Burke's Peerage and some genealogy work by Thomas Richard Gardiner. One goal is to fill in Thomas' and Margaret's ancestry. 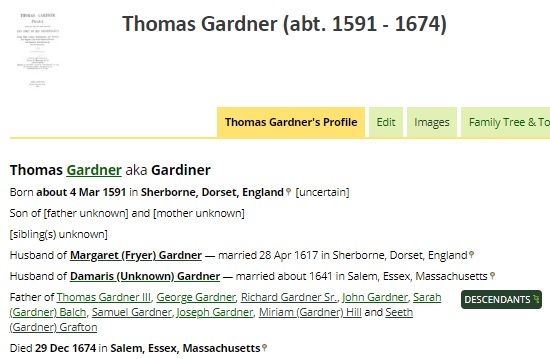 As well, looking at how the Gardner families relate will continue to be of interest. 12/14/2012 -- This has been a popular post. 02/05/2013 -- Recent interest in Richard III has caused a renewed focus on information about his life. This post from about two years ago was motivated by a Wikipedia page whose content is now undergoing scrutiny. Since this discussion pertains to our work, we'll keep abreast of things as they move along. Note: there is a vote going on about the possible deletion of the page on William Gardner. 02/06/2013 -- The William Gardner page was deleted today (see discussion page). Also, see section on Wyllyam Gardynyr (archived 06 May 2013) under Richard III talk. When making the Remarks yesterday, I had not looked at the article since this post was done and was not aware of the expected time for the deletion. The William "wiki" page was one item on a huge pile of material to review that relates to origins (open topic, future consideration). 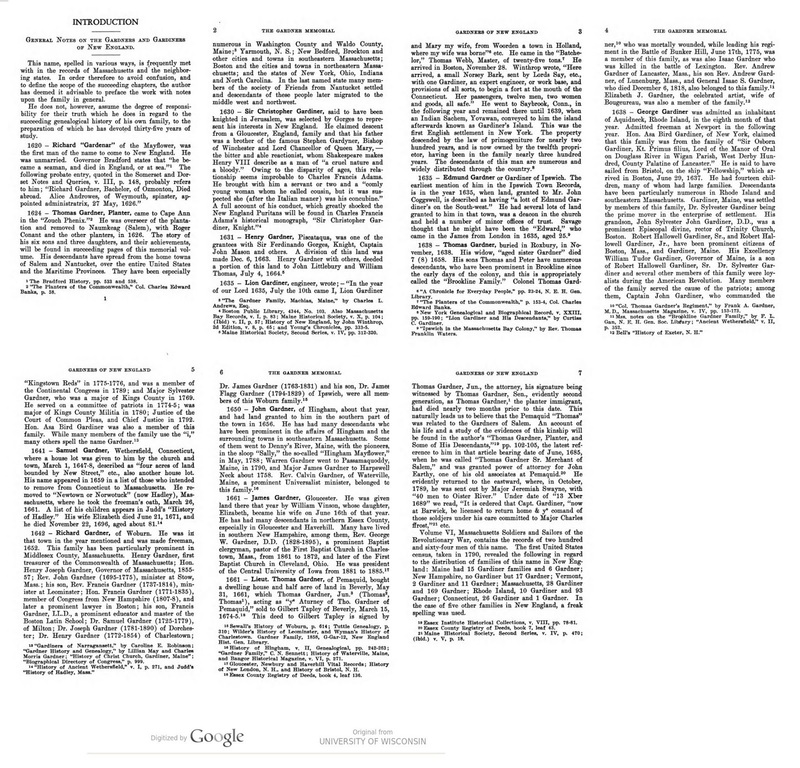 Also, the author (of the William Gardner page) seems to have had more than one page deleted from Wikipedia. At this point, let me put a link to Wikipedia's Five pillars as a reminder about content to be put there. 06/15/2013 -- John Farmer wrote that Thomas was from Scotland. Origins are, and will be, a focus. ... As of today, this is the all-time, most-read post. Coming in second is Old Planters, Beverly. 06/15/2013 -- For the Wyllyam Gardynyr discussion, see prior version (archived 06 May 2013). At some point, I ought to see what the deleted Wiki pages were all about. That is, looking at origins would encompass the whole bit, out of which would then come the real story. That has not been done, that I can see, as of 2013 is not troublesome. Things come forward all the time. Too, has anyone surveyed the work to date in a comprehensive manner (meaning, of course, scholarly)? One goal will be to start, and sustain, such studies that would augment what has already been done as well as explore holes (which have to be defined, for starters). In the meantime, we'll try to document Thomas' life (such as, pulling out things related to character) and progeny. Also, we ought to look more closely at Damaris Shattuck and Thomas. That he married a Quaker and didn't suffer the wrath of the likes of Endicott says something (Mary Dyer was hung in 1660). 06/10/2016 -- There is more to the story than I realized: Bosworth and more. We will have more to add to the FAQ. 10/11/2018 -- Most links work (not bad after 10 years). Resorted the Remarks to earliest to latest as this subject will be an ongoing one. And, we can just append a next comment. Just checked on page for Stephen Gardiner, the archbishop. It mentions William as possible father, whereas before it said that John was thought to be his father. We have seen that genealogy can involve a large number of families and individuals. 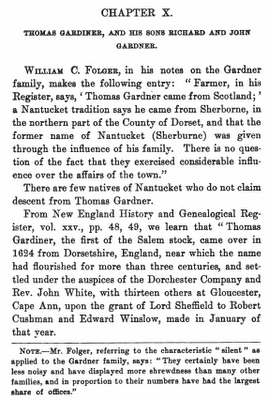 That is, Thomas Gardner of Salem has thousands (100s of) descendants that could be named. So, one on-going exercise might be to look at the disparate trees that come from research by various families and try to merge these. D.A.R. 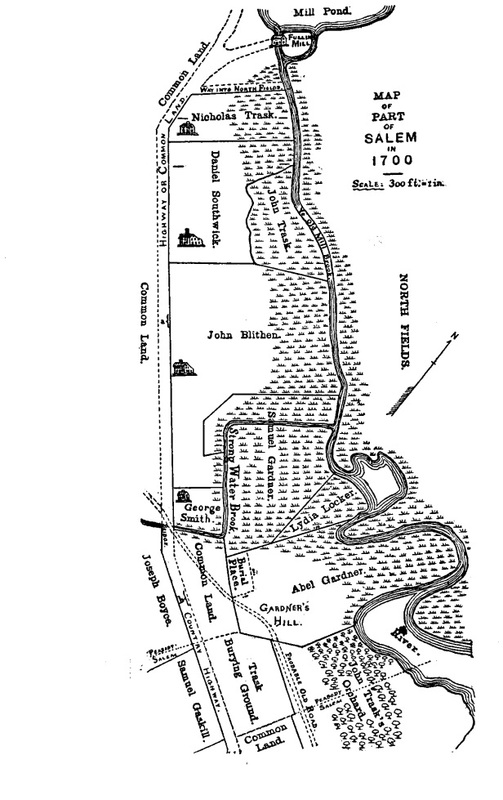 has a project that is along this line where threads, from the member to the patriot, are documented at each generation. Then, these ought to establish a tree that has some strength when joined together. Our problem is that we have to go back before the time of the American Revolution which is the focus of D.A.R. 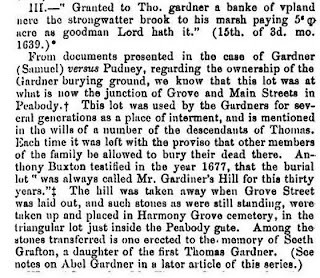 For instance, in Dr. Frank A's tree, there is an ancestor who was at Bunker Hill, 1775 -- Thomas Gardner descendant of Thomas Gardner of Roxbury. What is the relationship between the Salem and Roxbury families? As well, there are many other patriots in the D.A.R database who are documented. Now, if we could start with a database, like the D. A. R. one, then it might be a little easier. Then, assuming that the different families have done a good job going back from the D.A.R information, we could attempt the a merge, with caution. Some other groups seem to offer this type of possibility, such as the descendants of Newbury founders. For several reasons, trees that have some RD link seem to be more full and better documented. But, too, having the RD list makes it easier as then the work is just going back to the gateways. Which, with a D. A. R. basis, one is only talking about 100 years or so to fill in. In this post, we look at a couple of trees that show convergence to a royal gateway for a Thomas descendant. There are many more that we hope to itemize in a separate post. In this case, the individual is Charles Francis Adams, Jr. (b 1835 - Civil War General) who is a descendant of Thomas Gardner of Salem through his son, Richard. Charles' maternal great-grandfather is Nathaniel Gorham, Jr (of course, also a Thomas descendant), who was a signer of the U.S. Constitution. One of Charles' paternal grandfathers is John Quincy Adams, the 6th U.S. President. Now, let's look at two of the many trees that have Charles in them. And, remember, each family only expands to the extent necessary for their work (it is rare to find a fully developed tree; is one goal here to get all of Thomas' descendants to 1900, for example?). One tree is from the Dowling family which shows Elizabeth Coytmore as great-grandmother of John Quincy, the forebear of the President. Elizabeth is on the gateway list maintained by the Brookfield Ancestor Project. Who is Elizabeth? She descends from Edward III of England. We will look for further information on her. 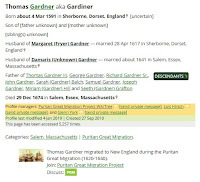 However, another tree (01/03/2013 - removed link as database is gone) expands the mother's side more and shows Myles Standish, who is also on some gateway lists. Myles is well-known from all the Thanksgiving stories in which he features. 01/06/2013 -- Ten years ago, The Atlantic had a nice article on Humphry's work. I ran across his site in the last couple of years, at some point, so it was nice to run across the article. 01/03/2013 -- One of the rootsweb databases disappeared which is good as it demonstrates the need to consider persistence (both short and the longer term). 04/30/2012 -- We see, in the tree examples, two of the early Thomases (of Salem and of Roxbury). That was not planned, but it is of interest for a couple of reasons. Many have these two related to each other; another view says not. After a couple of years of experience now, these types of nuances become more apparent. 01/14/2011 -- Improve the discussion of a ratcheted method where attempts at closing a gap (more extrapolation than not) would have a stronger basis. Added links. 11/23/2010 -- Necessary studies include prosopography. Charlemagne features so heavily in the royal trees due to the amount of sponsored work related to identifying his descendants. The list of descendants will be large for Thomas and Margaret. One goal will be to fill in the tree, completely, to about the year 1900. That would cover over 250 years on this side of the pond. Too, there will be posts dealing with the RD theme. Why? Looking at associated families can help us fill in Thomas' past. As said before, I'm going with Savage's view, for now. So, expect to see pointers to work done by other families. Of course, work will continue for the period from 1900 to 2010. But, for the next few posts, the blog will focus on the earlier times. We hope to put out interesting stories from time to time as they are found. The intent is to have GEDCOM files, at some point, with confirmed data; the organization of these files is still an open issue as they will need to be partitioned, I think. 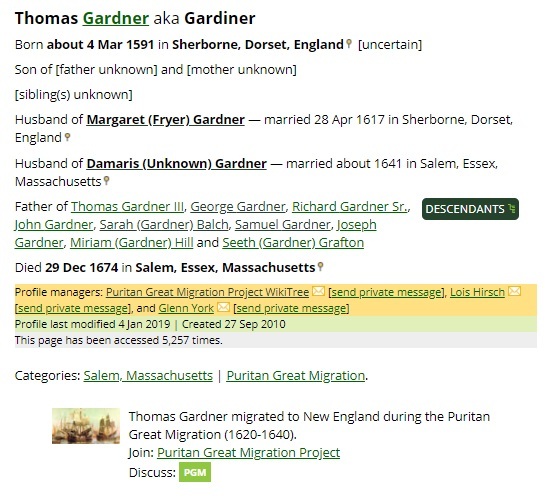 By the way, GEDCOM (below are pointers to trees that intersect the Thomas') is a standard way to document genealogical data. But, there need to be an interesting way to present the data. The below examples are from the RootsWeb site. Before we show some RD links, let's talk numbers again. Going back to Thomas and Margaret would be around 10 to 12 generations for people living now. So, if there were a fully developed tree going back from oneself, you would start with your two parents, then your four grandparents, then eight 1ggps. That's three generations, so we're using 2**3 (or 2 to the 3rd power). 2 to the 12th power is 4,096. You'll see example trees below. The actual number can be much lower due to things like intermarriages. But, when we come forward, from Thomas and Margaret, it is not binary. In fact, there are nine kids at the first generation. Yet, if we considered that there were only four, for each generation coming forward, by the time of 12 generations, there would be 16 million cousins for your self. Or, as they say, Thomas and Margaret would have that many descendants living. In total, as one summed over the generations, total descendants would be 22 millon. Now, we'll start with a Samuel descendant named Simon Stacy Gardner (Plumer tree). Simon is on the Daughters of the American Revolution list of patriots and is only four generations from Thomas and Margaret (Thomas/Samuel/Abel/Abel). Simon's father was Abel whose grandmother (Elizabeth) was a sister of John Hathorne. But, Elizabeth, and her husband's family, not fevered by the mania and did sane things, like try to save Rebecca Nurse. If we look at work done by various families, we can find charts like this example pedigree chart for Simon 's mother's grandfather (Thomas Stacy - Smith/Goodale tree). As mentioned before, these types of charts will be verified. But, for the point of RD, notice that Margery Eyre (Caldwell tree) is in the tree; her grandmother is shown to be Elizabeth Fitzwilliam (Bevan tree). By this time, the tree has really expanded. Poking around brings up a lot of royal links, such as this for Henri I, of France (Bevan tree). Wikipedia has a chart for his ancestry. Given that we went backward (with an expanding tree, remember? ), how do we know that the link from Elizabeth back to Simon Stacy can be supported? We'll go into that next time and use another example that leads back to what is called a gateway. That is, a number of immigrants had documented histories. Many families knew this, at the time. For many, the knowledge was lost. But, if one can map back to a gateway with documentation, then one can consider RD for one's self. The rule, according to the NEHGS, is for us to handle this side of the pond (back to the gateway). Then, issues over there will be resolved via their methods. And, through time, there is progress as missing information comes to fore (we'll later use the example of a Mayflower passenger who seemed to have been lost but was later found to have lived in Salem). Again, the reason for following this method is that the closer one is to a royal line the better the sourcing material. Then, from those one can try to fill in gaps. But, it is not always possible to do so (examples abound). 04/27/2011 -- We'll get back to the pedigree of Simon Stacy Gardner. One of his grandfathers was Thomas Maule. 12/06/2010 -- Another tree for Simon would show RD from Thomas through Samuel / Abel / Abel (Dollhopf family). This lineage has John White who, according to Bevan, descends from Henry III (Wikipedia ancestry chart). -- If we skip forward, to Frank A (who will have his own page), his grandmother (Lucy F. Wilson) has John White as an ancestor, as well. This is through Elizabeth, daughter of Rev. William Walton (Bevan - we'll get to that when looking at Frank A.) . 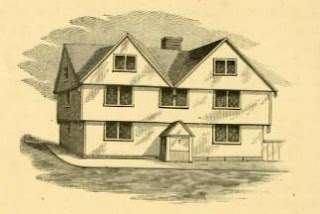 Benjamin Brown Gardner, Lucy's husband, was Simon Stacy Gardner's grandson. 11/12/2010 -- RD example using a gateway. 11/11/2010 -- Ole Larson is back for one RD reference. His genealogy site is a good example. 11/10/2010 -- The Bevan trees will be used a lot. The family's chief immigrant is on the list of gateways. A claim is firmed by using confirmed gateways, however there is missing information that can be discovered at any time (Richard More, for example). Too, efforts like the D.A.R. of verifying pedigrees (essentially a linear projection) and then matching these up to build a tree will allow holes to be identified, and filled.